Looking for a simple recipe that will wow your friends? This is it. Pickled onions are easy, fast and can be your go-to source for a flavor punch. They take ordinary dishes and bump them up a few notches to something more sophisticated. Use these onions as a side dish or as a condiment on sandwiches, grill-cheese, hamburgers, hot dogs, green salad, egg salad, and more. With the holidays coming up, serve them with cold cuts at a party, give them as a hostess gift, or keep them on hand for a fast appetizer with cheese, crackers and wine…you get the idea. 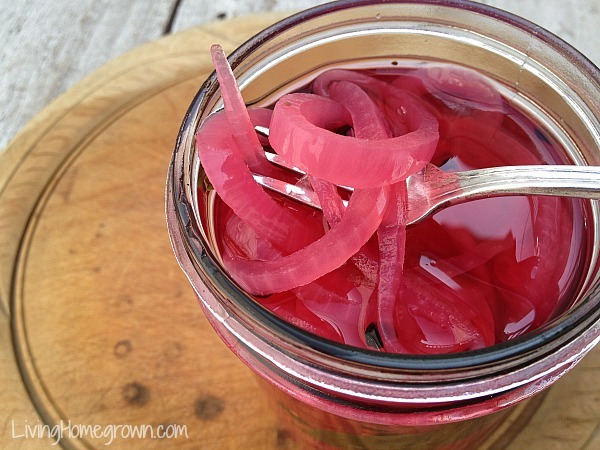 I prefer to make pickled onions with red onions mainly because I love the pink color. But you can use any onion you want. My second favorite is a sweet Maui onion. I like white wine vinegar for this recipe because it does not overpower the spices. But if you want to try something else (like apple cider vinegar), it is okay to do that. Just note the darker color will darken white onions. For safety, just be sure that the vinegar you use is at least 5% acidity. Do NOT add more water to this recipe or you dilute the acidity and that would be unsafe. The sugar is in this recipe to counter the acidic flavor. It also helps with the color retention and the texture of the onion. You can add up to 1/3 cup more sugar if you want a “sweet n’ sour” taste (my kids love that version, of course). But I would not reduce it or cut it out completely because this recipe is too acidic tasting without it. I call out pickling salt in this recipe because you want a clear brine. Regular table salt will give you a cloudy brine because of the anti-caking agents. Stick with pickling salt for best results. Now HERE is where you can get creative! You can change out the spices any way you wish. 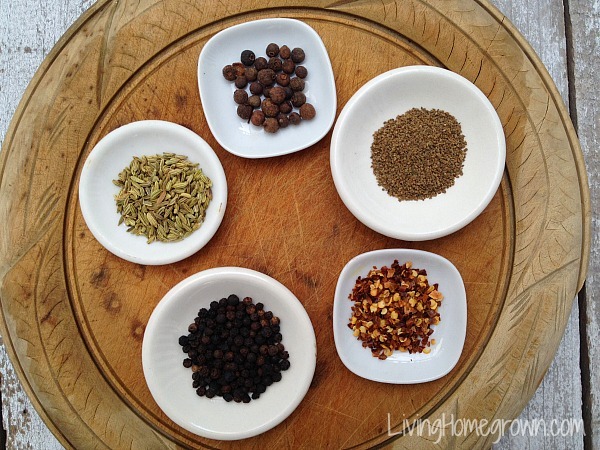 Just keep the basic brine recipe the same and change the spices that you add to each jar. I have a favorite combo listed below in the recipe, but you could add any combination of the following to make the recipe your own: mustard seed, celery seed, juniper berries, fennel seeds, red chili flakes, peppercorns, garlic cloves, sliced ginger, bay leaves, thyme, rosemary or other herb that sounds good to you. Make it spicy or make it mild. Make each jar different! It is up to you. This is a small recipe that makes just 2 pint jars. You can certainly divide it into four 1/2 pints for gift giving. (Use the same processing time.) You can also double the brine and number of onions to make more. Just add the spices to the appropriate number of jars. If you want to store these pickled onions on the pantry shelf, you must water bath process them. But if you are going to be using them right away, you can make them up and store them in the refrigerator without canning them. They last up to 3 weeks in the refrigerator. Either way, wait at least a 24-48 hours before eating so they have time to absorb the spice flavors. Place your clean jars in the canner or stockpot to heat them. Prepare your lids according to the manufacturer’s instructions. The hot water will keep the jars hot until you are ready. Bring a medium-sized pan of water to a boil to blanch the onions. When the water is boiling, quickly add all the sliced onions to the water. Cook for just 30 seconds. (Seriously, that is all you need.) Then immediately strain off water. Let the onions sit in the strainer while you heat the brine. In a small saucepan, combine all the brine ingredients. Bring to a boil and stir to dissolve the sugar and salt. This takes just a couple of minutes. Meanwhile, remove the jars from the hot water bath and add the spices to the jars. Pack the jars with the blanched onions, leaving a 1/2-inch headspace. Pour the hot brine over the onions, leaving a 1/2-inch headspace. Remove air bubbles. Wipe the rims and add your prepared lids and rings. If you are NOT canning them, let them cool 1 hour and then place in the refrigerator and use within 3 weeks. Done! 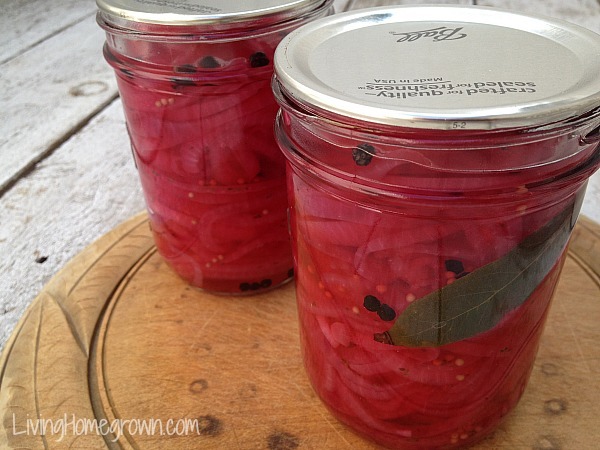 If you ARE canning them, process the jars immediately in the water bath for 10 minutes. If you are above 1,000 feet, adjust your time for altitude. Sealed jars should last 1 year on the pantry shelf. 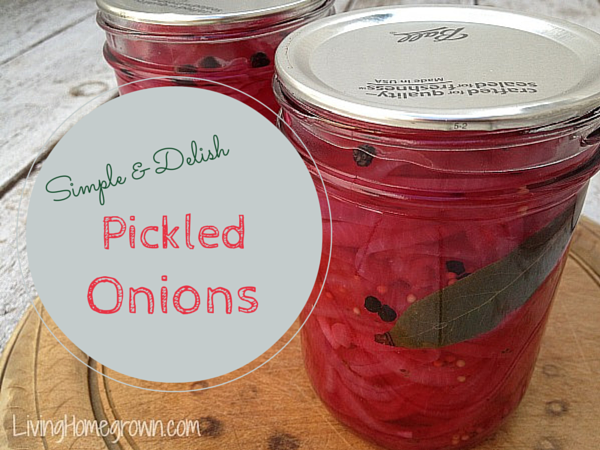 I have had homemade pickled onions before and they were killer on hamburgers. Since they were a gift, I never knew how easy they were to make. And I love the color! Thanks for this. You are very welcome Ashley. would rIce wIne vInegar be a good substItute for the whIte wIne vInegar?